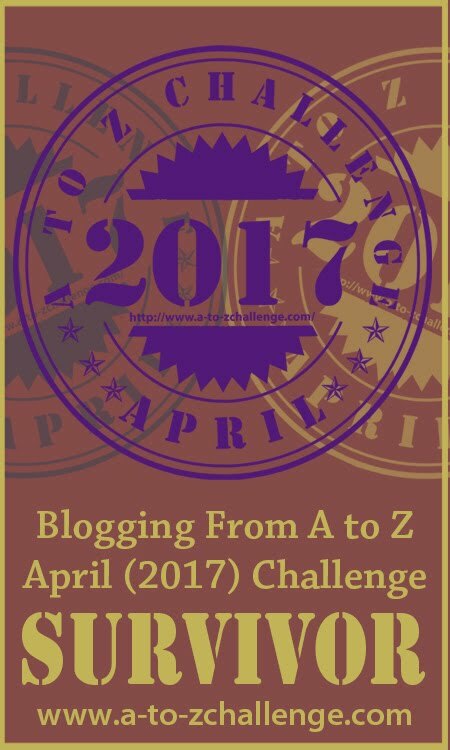 The A to Z challenge is an annual blogging event where participants aim to write a post a day for a whole month (Sundays off for good behaviour, excepting years where April has five Sundays). The challenge was the brain child of Arlee Bird, and like Topsy has grown. Several thousand bloggers participate and a great time is had by all… But what is the challenge all about. The party line can be explored at the official A to Z challenge website, but it is really quite simple – a daily prompt of the letter of the day, starting with A on the 1st April (no joke), and working your way through the alphabet to Z on the 30th (except, where, as noted above, the fall of sundays plays hob with the schedule…). Some people like to make things even more challenging by choosing an additional theme. I’ve had a great time both times I’ve tried it, and I’ve survived (if only barely). This then is my summary page on the Challenge. I’ve created an index for each year, and when I manage to make the roadtrip (checking out other challengers blogs throughout the rest of the year, I’ll link to the relevent blog posts here as well. My 2016 theme was how to write a thesis. My 2017 theme was The Materials of Fiction and Mythology.